Writing today (Feb. 23, 2014) in the journal Nature Geoscience, an international team of researchers led by University of Wisconsin-Madison geoscience Professor John Valley reveals data that confirm the Earth's crust first formed at least 4.4 billion years ago, just 160 million years after the formation of our solar system. The work shows, Valley says, that the time when our planet was a fiery ball covered in a magma ocean came earlier. "This confirms our view of how the Earth cooled and became habitable," says Valley, a geochemist whose studies of zircons, the oldest known terrestrial materials, have helped portray how the Earth's crust formed during the first geologic eon of the planet. "This may also help us understand how other habitable planets would form." The new study confirms that zircon crystals from Western Australia's Jack Hills region crystallized 4.4 billion years ago, building on earlier studies that used lead isotopes to date the Australian zircons and identify them as the oldest bits of the Earth's crust. The microscopic zircon crystal used by Valley and his group in the current study is now confirmed to be the oldest known material of any kind formed on Earth. The study, according to Valley, strengthens the theory of a "cool early Earth," where temperatures were low enough for liquid water, oceans and a hydrosphere not long after the planet's crust congealed from a sea of molten rock. "The study reinforces our conclusion that Earth had a hydrosphere before 4.3 billion years ago," and possibly life not long after, says Valley. The study was conducted using a new technique called atom-probe tomography that, in conjunction with secondary ion mass spectrometry, permitted the scientists to accurately establish the age and thermal history of the zircon by determining the mass of individual atoms of lead in the sample. Instead of being randomly distributed in the sample, as predicted, lead atoms in the zircon were clumped together, like "raisins in a pudding," notes Valley. The clusters of lead atoms formed 1 billion years after crystallization of the zircon, by which time the radioactive decay of uranium had formed the lead atoms that then diffused into clusters during reheating. 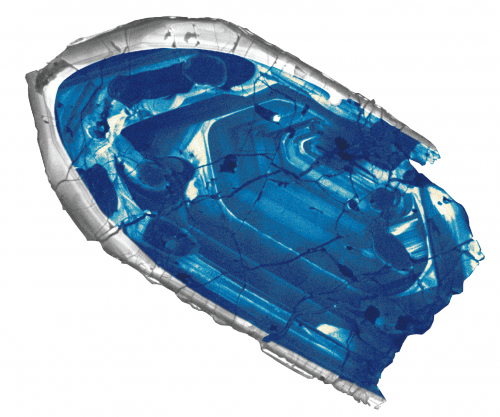 "The zircon formed 4.4 billion years ago, and at 3.4 billion years, all the lead that existed at that time was concentrated in these hotspots," Valley says. "This allows us to read a new page of the thermal history recorded by these tiny zircon time capsules." The formation, isotope ratio and size of the clumps—less than 50 atoms in diameter—become, in effect, a clock, says Valley, and verify that existing geochronology methods provide reliable and accurate estimates of the sample's age. In addition, Valley and his group measured oxygen isotope ratios, which give evidence of early homogenization and later cooling of the Earth. "The Earth was assembled from a lot of heterogeneous material from the solar system," Valley explains, noting that the early Earth experienced intense bombardment by meteors, including a collision with a Mars-sized object about 4.5 billion years ago "that formed our moon, and melted and homogenized the Earth. Our samples formed after the magma oceans cooled and prove that these events were very early." Amazing how some scientists can deduce so much from the tiniest bit of rock. Some call that real science. More importantly --which does verkle call it? It is science. The geochemistry and other sciences involved have been rigorously demonstrated to be based on facts through research, discovery, theories and millions of hours of human brain sweat. Prove them wrong with facts or be ignored as ignorant naysayers always have been. Hello, new reader and commenter here. I'm just some curious guy, interested in knowledge and science-related news. That is why I find the articles on this website very interesting. These bits are indeed small on a human scale - the average Zircon used in dating is only about 0.2 millimeters in diameter. But that is still a huge number of atoms. 1/250,000 cm3 at Zircon's density of 5.7 g/cm3 is about 22 micrograms. At a molecular weight of 123, that is ~0.15 micromoles, and at three atoms per molecule that is around 280,000,000,000,000,000 atoms. Of course most of the atoms are of little interest, so let's look at just the lead atoms. These are in clusters ~50 atoms in diameter, and the abstract of the paper says that these are spaced 10 nm to 50 nm apart. Assuming 30 nm on the average, a that is still ~100,000,000,000 such clusters of lead atoms in a 'tiny' zircon! And each of those 100,000,000,000 clusters 50 atoms in diameter has ~60,000 atoms, so these bits of rock are NOT tiny on an atomic scale. It is indeed amazing, and scientists will debate whether the age is 4.4 billion years or 4.3 billion, but it is far from 'foolhardy'. Yes, it is well accepted the the Jack Hills zircons are older than the rocks that they are embedded in, often by many hundred million years. That is why the zircons themselves are analyzed in such detail to figure out the conditions they formed in, rather than looking at the surrounding rock. The fact is, despite comments by Jeffhans1 and other such, the "facts" of "science" are only things that "scientists" claim from behind "laboratory" doors, but that not one member of the "rank and file" can ever definitively describe having been proved unquestionably through evidence tangibly placed in "rank and file" hands. And, frankly, it is a self destructive gullibility that shills display, or that they try to promote, when they suggest that it is not necessary for what they see as "beasts" of burden" to have things proved to them. They see the "rank and file's" only "right" to be to be told what to believe without question. But liars have to do their due diligence, to provide clues they are lying. Note the claim that lead atoms form in clusters. In a random distribution of decaying elements, by what "science" claims happens, lead atoms should be distributed uniformly. do you believe in geocentric orbit or heliocentric orbit? Why? In a random distribution of decaying elements, by what "science" claims happens, lead atoms should be distributed uniformly. proof? Links? Studies? supporting data for statement? Intentional leading for what cause? This seems to make a nice, predictive timeline. Other suggestions have been a late Earth-Moon formation @ ~ 150 My after Tellus (protoEarth) formed, which has been possible because absolute crater and Apollo rock datings have been iffy. But this seems to close that window. Meaning that at any time most of Earth's surface was unmelted and could contain the oceans. @Shitead: The oxygen ratios in these zircons (the cold Earth oxygen ratios) are AFAIK Earth's after it was equilibrated, not from asteroid belt impactors or further out. Abiogenesis seems to have happened fast and easy, e.g. dirty RNA pathways predicts the transition geochemistry - biochemistry takes less than 100 000 years. 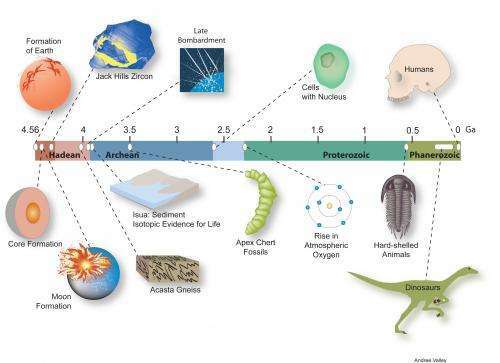 However, there has been a tension between early Earth geology and gene phylogenies in that the gene root that evolved after abiogenesis took place tends to be pushed beyond 4 billion years ago. That nicely incorporates the latest putative fossils, two independent trace fossils in Isua of BIFs from iron oxidizing prokaryotes and organic carbons @ 3.8 billion years ago, but ran up against the uncertainty of the Late bombardment, late ocean formation, late crust formation and late Moon formation. And with these results those tensions are gone.